Euclid Wins "Spirit Award" at the 2017 SSL Championships! Euclid is known for great swimmers and a lot of Panther Spirit! & sponsors who made 2016 another great year to swim in Euclid! The Euclid Panther's Summer Swim Team held their end of the summer banquet at Tizzano's Party Center in Euclid, OH. First of all, thank you to all the swimmers for all their hard work this season. Choosing to attend early morning practices and crack of dawn Saturday swim meets over sleeping in and inactivity sets you apart from many other children. The health benefits of swimming are innumerable, and the dedication you've shown to the sport this season, and competitive experience you have gained, will positively influence your life, long after you get out of the pool. Thank you to the coaches for your time, effort, and expertise. Our swimmers look up to you and we appreciate all you have done for each and every swimmer this season. Your dedication to the betterment of the swimmers and to the program is commended. Thank you to all the parent volunteers who have gone above and beyond with your effort in making the program run smoothly. Without your extra time and effort we would not be able to do all the things we do for the swimmers and the program. Thank you to all of our official sponsors and those business who have donated to our swim meets. Your generosity is much appreciated and we look forward to an ongoing relationship for swim seasons to come. And finally, to all the parents, guardians and families of all our swimmers who have chosen to support your child, or children, this season. In spite of many trips to and from the pool and many hours spent at swim meets just to watch them swim for a 1 minute at a time, you clearly understand the importance of investing in their overall health and development. When it is so much easier to just let them sit around all day in front of a electronic devise, or television, you have decided that getting them to the pool makes a lot more sense. Beach Club Bistro "Charity Tuesdays"
The Euclid Panthers Summer Swim Team received 20% of all food (dine in only) for those using one of the "Charity Tuesday" coupons during all Tuesdays in August. Much thanks goes to Beach Club Bistro owner Greg Jurcisin for his generosity, to the chef for amazing food and to the staff for excellent service. Thank you to all the swim families and friends of the Euclid Summer Swim Team that supported this "win-win-win" fundraiser! Longtime Euclid Swim family and owners of CP's Cooler have graciously offered the Euclid Panthers Summer Swim Team 10% of its sales for the entire day! 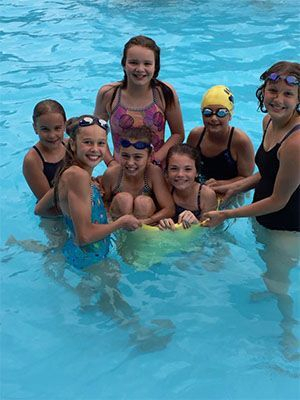 Mile and miles swam at the 2016 Euclid Panther's Summer Swim Team Swim-a-thon. Congratulations to all that participated! A question you never thought you would ask: How many swimmers can you fit into a swim cap? Apparently not one, but TWO 11-12 year old Swimmers!